I count myself as a fan of This War of Mine. Thanks to its stark world and debilitating survival elements, it stood apart as a game that was a fully-realized representation of the harshness of a war-torn city under siege and on the brink of collapse. Sadly, it was an all-too-real situation for many innocent people who had to endure the Siege of Sarajevo during the Bosnian War, which the game drew inspiration from. 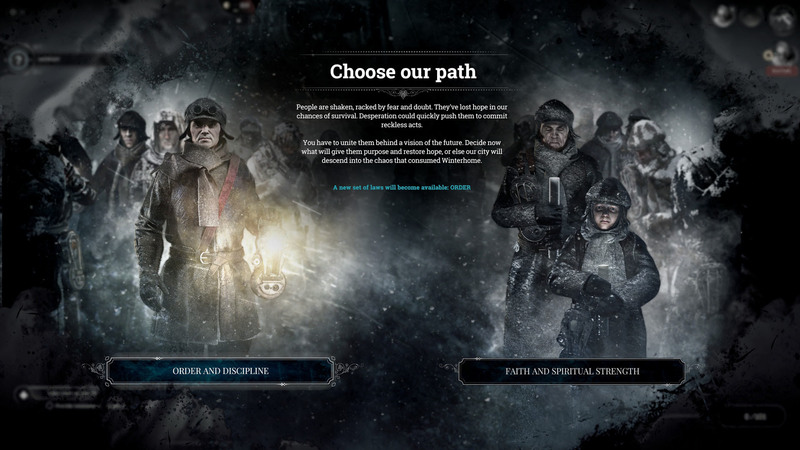 The grim tone This War of Mine sets has barely changed in 11 Bit Studios’ follow-up, Frostpunk, a city-building simulator set in a snowy landscape. Instead of taking control of a small group of civilians attempting to survive inside a besieged city, however, you are challenged to take on a far greater role for the sake of humanity. The story itself takes place during the 1800s. 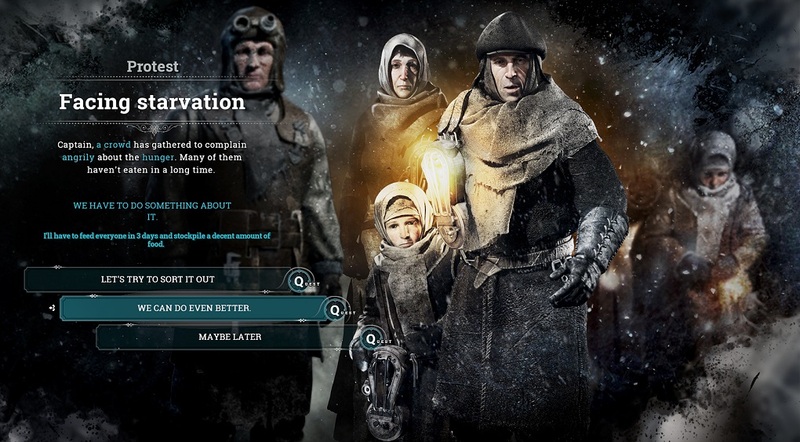 After escaping from London with a group of refugees, you as the player are entrusted to rule over the last city on Earth long after the planet has seen destruction due to a sudden Ice Age. In this position, you must help maintain the sanity of society while managing everything revolving around the city’s infrastructure. In the center of this outpost is a giant generator that requires coal to operate. To get the coal, you must order your scarce number of workers through chest-high snow drifts to gather the necessary resources. On this dreary note, the game begins. While you may feel inclined to get to know your fellow citizens as I did to learn more about their tribulations, these same people can fall gravely ill and eventually die if they are not treated. I can’t tell if it’s due to the temperature, but after a while, I soon became numb whenever the notification popped up that one of my people died. Pretty soon, they simply became a statistic as I continued my fight against the odds. There are several factors you will need to compensate for while tending to the needs of your city’s inhabitants. For one thing, keeping them warm and healthy while persevering the icy tundras of the derelict world is among your top priorities. This will require gathering the aforementioned coal to power the generator that delivers heat to the buildings. If the temperature dips too low, this may cause some factories to shut down to avoid a safety hazard. Once the Generator is working, you are allowed to build homes, buildings, and other structures that are placed on a radial grid in order for the available heat to be dispersed appropriately. In fact, coal becomes such a crucial resource I found myself instructing all available workers and engineers towards gathering it. Aside from wood, it is easily the material you’ll be focusing most to gather and struggling to maintain. You could argue its scarcity ends up lending too much of the game’s overall difficulty since heat plays such a vital role. 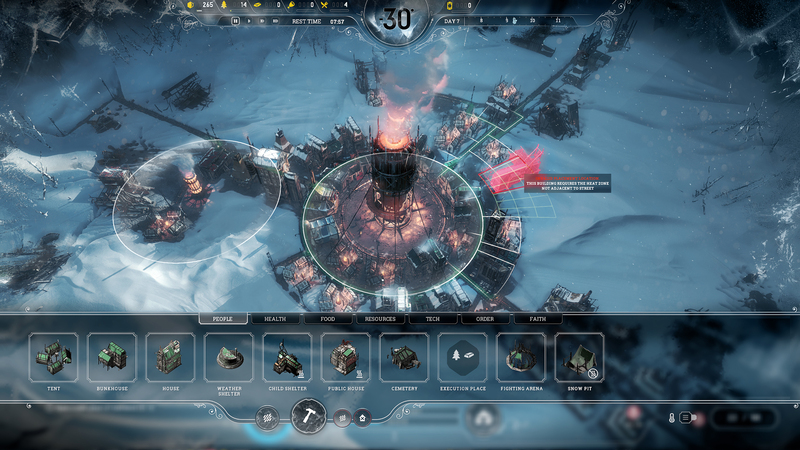 So long as you have that under control, Frostpunk becomes a far more manageable experience. That isn’t to say fighting to survive can’t be incredibly engrossing either. While I was preoccupying myself with gathering resources, my eyes were boring a hole into two very important meters at the bottom: Discontent and Hope, which are used to gauge the mood of my citizens. Every now and then, the people may approach you to make a promise that may involve building a new care center, constructing a bar to let them unwind from the day, or people more shelters to take care of the homeless. Break that promise, and their Discontent will sharply go up while their Hope shrinks. This also happened whenever I always tried to plan several steps ahead in researching new technology when my people demanded short-term solutions. Every now and then, I was alerted to either good or bad news whenever an event occurs in and around the city. Most of the time, it’s designed to make you feel terrible. A man whose leg was amputated committed suicide because he no longer felt his life was worth the effort. A boy was found frozen next to the grave of one of their parents. While the game attempts to balance it out with some words of praise from a person who benefitted from a newly-built watchtower, those moments of bliss tend to be very short-lived. At certain points, the game will also ask you to make a choice regarding how to handle an event. If there is a health crisis, will you promise to heal everyone as soon as possible for a bump to Hope, or do you play it safe and only promise to heal a few that may affect their Discontent? Many of these situations involve these types of risk and reward judgments. As you can imagine, by having far more people under your beck and call, this potentially makes the risks that much greater and at the same time, that much more stressful. If your experience is anything like mine, you’ll tend to risk angering everyone just to keep them all alive for another day. These decisions become far more meaningful as the game goes on to the point where it can determine whether your next move results in a Game Over. To balance things out, you are given an opportunity as the ruler to pass laws which can be done once every 18 hours, and once you’ve decided on a new law, you won’t be able to change it until the time is up. These laws offer up the same risk/reward circumstances, and soon, you’ll come to a point where you need to figure out how you’re going to keep the citizens motivated when they’re facing an eternal winter. Should you motivate them by instilling order and discipline, or introduce faith and spirituality to turn their dispositions around? Both are designed to allow you to exert some form of control, but you are basically deciding whether to be portrayed as a despot or a god in the eyes of the people. I went with the former since it felt like my town was well on its way to martial law, anyway. It was either that or go down the path of religion which involves building shrines and organizing public executions. Either way, I knew I was going to be portrayed as either a hero or a villain to many. For such desolate scenery, Frostpunk is a gorgeous game from its own perspective. Even on my (incredibly) modest rig where I was for forced to put the game into low-to-medium settings to get things to run smoothly, I was still taken aback by the contrasting colors that played across my screen. This becomes far more striking as you near the end of the story campaign and the frozen hole you’re in is teeming with productivity. Seeing the generator fire up with a giant blaze every morning while seeing smoke billowing out across the snowy skies induces some powerful imagery. It reminded me of my time with Introversion Software’s DEFCON where a semblance of beauty could be found amidst all its bleakness. I only wish I was able to zoom in further than the game allows as I felt sort of disconnected from the plight of my people. 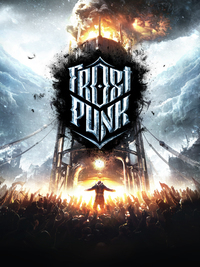 In the end, my time with Frostpunk lasted 45 days, or around 15 hours according to my game clock. Before this happens, an event occurs. The city I had worked so hard to cultivate was on the brink of collapse due to the overwhelming conditions that were placed on myself and my beloved Commonwealth. Unfortunately, once the special event is over, the game kind of ends abruptly. Unlike other building simulators, you are not given the opportunity to endlessly build up your city. On the other hand, 45 days in, I had already unlocked everything in the research tree. Sure, I could go back and research different laws, but by that logic, I was forcing myself to try something different for the sake of it. Having this time limit in place may turn some players off; the game could really benefit from a Free Play mode. Beyond failing before reaching the end, there’s no real reason to replay the main campaign mode. Thankfully, depending on how long you survive, the game unlocks special scenarios that will put your abilities to the test. One involves managing a city that already has hundreds of refugees living in a shocking amount of unrest, and another requires you to build several automatons while your available workers incubate a small number of storage vaults. 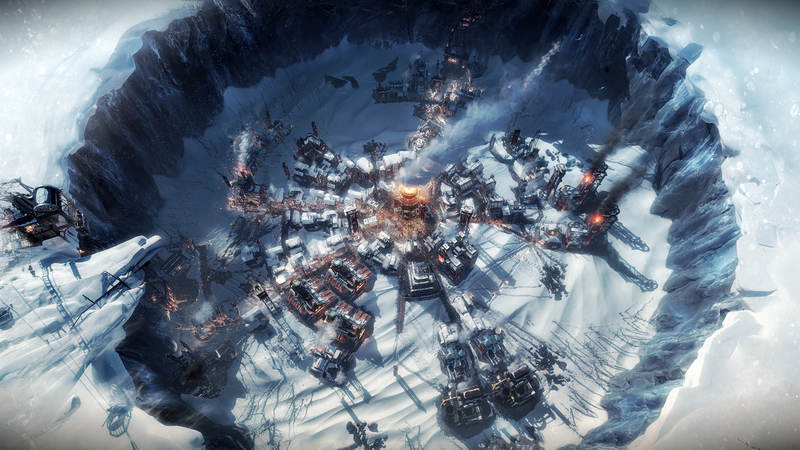 So long as you can deal with the stress and difficult decision-making, Frostpunk is an addictive and gorgeous-looking city-building survival game that is well worth your time.